Pro-abortion writer Jill Filipovic wrote an article for Cosmopolitan yesterday taking prolifers in Michigan to task for not getting engaged in the Flint water crisis, because the crisis appears to have led to an increase in miscarriages. While the Flint water crisis is a useful tool for framing her point, her main point is really just the common refrain that prolife people aren't really concerned about life; our main motivation in her mind is that we're freaked out by working women. That's ridiculous. Right to Life of Michigan has been run by full-time working women longer than Jill Filipovic has been alive. Rather than just respond to her real argument—that deep down every prolife person is just prolife because they need to repress women—we'll be good sports and engage her on Flint first. Filipovic lives in Nairobi, Kenya, and so she doesn't have the benefit of knowing details about the situation on the ground. The most important underlying issue in Flint is that several critical trends have left Flint with half of the current population they had in the 1960s. This economic disaster had led to many ongoing calamities. Right to Life of Michigan simply isn't equipped to confront trends like automation in manufacturing or globalization. Most of the groups involved in assisting Flint in the water crisis aren't directly engaged on those foundational causes either. Nor should they be; they should stay in their lanes of expertise. The water crisis itself came about because Flint switched their water from Detroit's system to their own river in preparation for using a new, cheaper source. Flint's infrastructure in the city wasn't equipped to handle the change-over, causing lead to leech into the water. Following the crisis there's a raft of criminal accusations involving government officials botching their basic duties to their constituents. Right to Life of Michigan is not involved in civil engineering, environmental quality, urban planning, or any of the many fields involved in the water crisis. We are not Attorney General Bill Schuette or the Environmental Protection Agency, who are charged with sorting out the mess. None of these important issues involve anything we have educational or legislative experience on. Is Filipovic right, though? Should we be involved in civil engineering, environmental quality, and urban planning, because failures in those areas have led to a situation that has increased the number of miscarriages in Flint? Let's assume the answer is yes. Our question, then, is why is nobody else ever held to this standard Filipovic wants to apply to us? If every human life has equal value, organizations involved in Flint ought be to devoting at least some of their time to abortion, using Filipovic's logic. In 2015, the MI Dept. of Health and Human Services reported 1,301 abortions in Genesee County, and 1,081 estimated miscarriages. Miscarriages in Flint are tragic, and there are people working to address them. Abortions are even more tragic because it's purposeful, direct taking of human life, so shouldn't more people focus on that? Why does nobody ever demand civil engineers, environmentalists and urban planners speak out about abortion? Now, you might object, abortion has nothing to do with getting clean water to the people of Flint. That's basically our entire point, isn't it? But there is an indirect connection that goes the other way. Thousands of abortions have exacerbated the very problem that caused the Flint water crisis. The main reason Flint couldn't afford Detroit's water system is because thousands of taxpayers are missing. A shrinking population is robbing the city of future bond money and other economic growth opportunities, leaving a city government with few good options and human capital to solve so many problems. Why does nobody ever ask other groups what they are doing about abortion? The Michigan Environmental Council currently lists 63 separate member organizations on their website. What are any of these groups doing about abortion? How many advocacy groups in Michigan are involved in ending abortion? The list is quite small. Why does nobody ever demand soup kitchens get involved with the American Cancer Society? Diet plays a role in cancer. Why does nobody demand Mothers Against Drunk Driving get involved in heart disease? Heart disease is the leading cause of death of mothers. Why aren't gun control groups involved in Flint? Don't they believe the lives of Flint citizens matter? The American Cancer Society has nothing on Flint on their website. Don't they care that lead is a probable carcinogen? This is silly. Each of those groups have identified a particular set of problems, and they develop expertise and engage people in those problems. A soup kitchen shouldn't be involved in dealing with manufacturing job losses; their job is to feed the hungry people, even if those people went hungry because they lost their manufacturing job. There's a million other people out there fighting over job creation, but none of them are there handing out soup on Main Street. The fantastical notion that prolife groups need to become political parties and engage on every policy issue only exists because the issue involved is abortion. Filipovic doesn't want to talk about abortion or basic human rights, because that focuses on the uncomfortable reality that abortion kills human beings using brutal violence. She says it herself in her column, "And so the focus on the fetus gets ratcheted up, and the debate turns on the right to life rather than a woman’s right to her physical self." Abortion is basically indefensible, so the best way to make the case for abortion is to point at someone or something else and hope nobody notices what goes on inside abortion clinics. Abortion is the number one cause of death in America, if it counted. Abortion has helped to devastate Flint's heavily minority population. In Michigan, Black women have a majority of abortions, 50.5%, even though the state is only 14% Black. More Black lives have been lost to abortions since 1973 than every other cause of death combined. That's appalling. What's Filipovic doing about that? Is she bothered by this racial disparity? What motivates prolifers? It's no mystery. It's as simple as this: stop killing babies! Ultimately, nothing we say or do will appease Filipovic or make her write nice things about us, because ultimately we believe every human life has value. Prolifers will never be taken seriously by people who believe unborn children have zero human rights. It's easier for them to picture us as heartless villains than focus on the hearts they stop every day in their own clinics. Do you remember when prolife presidential candidate Ted Cruz came to Flint to supply the prolife pregnancy centers in town with water to hand out to residents? Pro-abortion groups and media folk savaged Cruz for it. Prolifers are not even allowed to help the very women they claim we want to oppress. Contrary to the news reported out there in Kenya, Michigan has been absolutely consumed and is still very engaged with the Flint water crisis. That's OK. It's a legitimate public health crisis. Public health groups in Michigan have a duty to be engaged on something that impacts their issues. We'll let more knowledgeable organizations work on their own issues, without demanding they drop their important work on focus on us. As long as abortion remains the number one killer in America, however, can't you agree it deserves at least one group focused on it? Ultimately this is not about Flint for Filipovic. This is about Filipovic's own mistaken beliefs on what motivates prolife people. If your real argument is that a movement largely run by women really hates women, maybe you are better off talking about something real, like people suffering in Flint because the many organizations and agencies responsible for handling the issue utterly dropped the ball. Maybe Filipovic should follow Senator Ted Cruz's example and hop on a plane from Kenya, skip New York, and at least do as much for Flint as he did before maligning all prolifers everywhere. Do You Know Debbie Stabenow? U.S. Senator Debbie Stabenow's record puts innocent lives in jeopardy. Below are examples of how her voting record fails to live up the important standard that every human life has value and deserves legal protection. Click on each link to learn more about her record. PARENTAL CONSENT - Stabenow voted against legislation requiring minor children to receive parental consent before having abortions. She has voted to allow children to be smuggled over state lines to avoid parental consent laws. PLANNED PARENTHOOD - Stabenow voted against efforts to defund Planned Parenthood, and even voted to give them $1 billion in additional taxpayer funds simply because they perform abortions. FREE SPEECH - Stabenow voted to rescind portions of the U.S. Constitution's First Amendment, potentially criminalizing educational posts just like this. ABORTION ON DEMAND - Stabenow voted in favor of partial-birth abortions and believes abortion should be legal throughout pregnancy, even during the process of birth. DOCTOR-PRESCRIBED SUICIDE - Stabenow voted to allow doctor-prescribed suicide in Michigan as Jack Kevorkian was traveling around the state euthanizing people with the eventual goal of performing live experiments on dying patients. CONSCIENCE RIGHTS - Stabenow voted to force the Little Sisters of the Poor to pay for abortion-inducing drugs against their will, and voted to force people to purchase insurance plans that cover abortions. TAX-FUNDED ABORTIONS - Stabenow voted to force prolife people to fund elective abortions with their tax dollars. FUNDING ABORTION OVERSEAS - Stabenow voted to fund organizations that provide and promote abortions overseas, inclduing organizations engaged in coercive population control programs. A topic that frequently gets overlooked was brought to the attention of many thanks to 60 Minutes. In August they aired a special on how Iceland has almost completely eliminated Down syndrome in their country. In the special they implied this as a huge medical accomplishment and an even bigger advancement for science. What they didn’t tell you was that Down syndrome hadn’t been eliminated: babies with Down syndrome were being killed off through abortion. Discrimination against people with Down syndrome isn’t new. For years many women have been encouraged by their physicians to have testing while they are pregnant to check for an array birth defects. Often when birth defects are diagnosed the women are pressured to have abortions. These innocent human beings are being killed without their consent simply because their lives are thought by some to be not worth living. A 1998 study from Wayne State University found that 87% of unborn children diagnosed with Down syndrome were aborted. Down syndrome babies aren’t the only ones being targeted. From 2002 to 2010 in the United Kingdom twenty-six children diagnosed with cleft lips or palates—conditions that are correctable by surgery—were aborted because of their disabilities. Those children would have had the opportunity to live out a completely normal life, but instead they were aborted. While the majority of abortions are done for purely social or economic reasons, the fact that there are high numbers of abortions being done on babies with birth defects raises troubling questions about how we as a society are caring for the most sick and vulnerable. Disabled individuals, no matter what age or status, are human beings worthy of protection. To say a disabled person is less of a human being diminishes the respect for every human life. The value of life does not depend on looks or abilities. There is innate dignity in every human life. This is the fourth entry in a monthly series we’ll be running throughout 2017 looking back at historically significant profile moments in our state’s history. There's only so many times you can say "no." That's a lesson former Michigan Governor Jim Blanchard had to learn the hard way, though not without a tragic cost of human lives. Michigan's ban on Medicaid-funded abortions is perhaps the most important piece of prolife legislation Right to Life of Michigan has ever initiated. It was also perhaps the most difficult legislation to pass. Two large roadblocks were pro-abortion Michigan governors Bill Milliken and Jim Blanchard. They issued a combined 17 vetoes of legislation to end tax-funded abortions. Thankfully the Michigan Constitution has a way for the people to override a governor's veto using citizen-initiated legislation. Citizens can collect enough petition signatures to initiate veto-proof legislation in the Legislature. Michigan's law does come with a caveat. Opponents of citizen-initiated legislation can collect their own signatures and force a public vote over the new law. 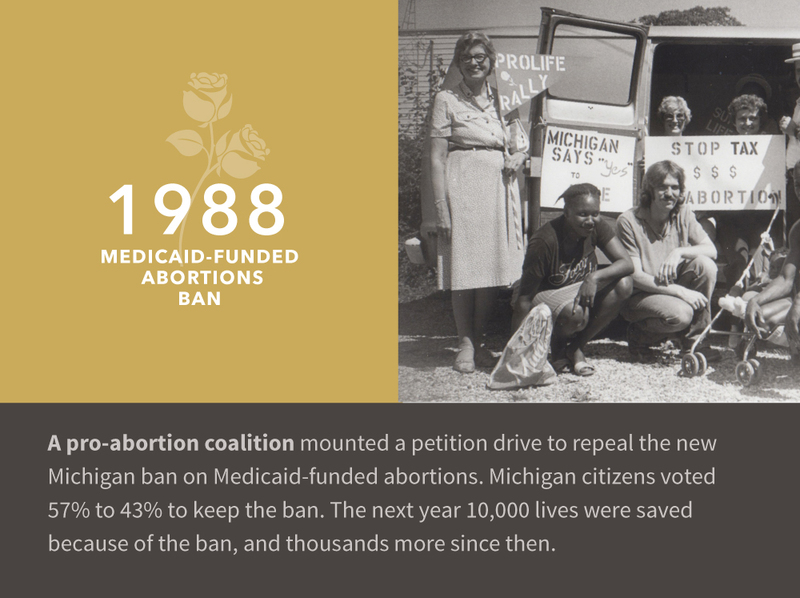 Abortion supports in Michigan collected about 220,000 signatures, putting our new ban on Medicaid-funded abortions on the ballot in 1988. On November 8, 1988, the people of Michigan voted 57% to 43% to retain the ban. The margin of victory was enough to send a loud message to abortion supporters than Michiganders would not tolerate being forced to pay for elective abortions. The effects of the law are simply awe-inspiring. In 1988 there were 46,747 reported abortions in Michigan. In 1989, with the Medicaid abortion funding ban in place, reported abortions dropped to 36,557. That's more than 10,000 lives saved in a single year! The ban has been in place for more than 28 years now. How many more lives have been saved since then? As many as 280,000? More? The human cost of abortion is so high that simple things like respecting the conscience rights of citizens can also save lives on a gargantuan scale. In 1989 our ban was challenged in court. Abortion supporters know they can often rely on biased judges to overturn the will of voters. In 1991 a three-judge panel of the Michigan Court of Appeals voted 2-1 to block the ban as unconstitutional. The two judges invented a right to tax-funded abortions in the Michigan Constitution, something even the pro-abortion majority on the U.S. Supreme Court wasn't willing to invent in the U.S. Constitution. The court challenge was ended by the Michigan Supreme Court in 1992 by a 5-2 vote, ensuring the law, the voters, and the lives of hundreds of thousands of Michiganders prevailed over the personal whims of two abortion supporters wearing black robes. Visit our blog in October for our next notable moment in Michigan history in 1990, when Governor Jim Blanchard learned his lesson. U.S. Senator Debbie Stabenow has a long record of supporting efforts to export abortions. Stabenow has voted numerous times against the Mexico City Policy. The policy prevents tax dollars from going to organizations that provide or promote abortions in foreign countries. The policy was first enacted in 1984 by President Ronald Reagan, and has been repealed and reinstated by pro-abortion or prolife presidents since then. Stabenow's most recent vote against the Mexico City Policy was January 28, 2009. President Obama had rescinded the Mexico City Policy and an effort by Congress to restore it failed. As we pointed out in a earlier post, Stabenow voted against the Kemp-Kasten Amendment in 2007. The law prevents the United States from funding coercive population control organizations overseas that include forced abortions or forced sterilization. In 2009 the U.S. House voted to exempt the United Nations Population Fund (UNFPA) from the Kemp-Kasten Amendment. In effect, the language would say it's OK in the case of the UNFPA for taxpayer dollars to go to an organization that has participated in coercive population control in China. In the U.S. Senate an attempt was made to remove the language, but it failed 39-55. Senator Stabenow voted to send tax dollars to the UNFPA. The UNFPA has been involved in Chinese population control for decades, including publicly praising their efforts. China's one-child policy (now two-child policy) has resulted in numerous gross human rights abuses. For decades Chinese women who became pregnant with a second child were subjected to forced abortions, violence, or heavy fines. The abuses in China continue today. Shortly after taking office President Trump restricted funding to the UNFPA once again. Today 75-year-old Michael Arthur Roth, M.D. had his medical license suspended for one year and had a fine of $25,000 imposed by the Michigan Board of Medicine disciplinary subcommittee due to unlawful possession of a controlled substance. A suspension of more than 6 months and one day requires that the physician retest prior to petitioning to have his license reinstated. The sanctions follow an incident that occurred two years ago and for which Roth is still facing criminal charges. In September of 2015, Roth was involved in a traffic accident where he hit a special-needs man. Due to the nature of the accident, Roth’s car was impounded by police, and they discovered the bodies of 14 unborn children in containers in Roth’s trunk as well as Fentanyl—a controlled substance. The discovery led to a search of Roth’s home which uncovered still more unlawfully obtained controlled substances. It is suspected that Roth was performing abortions on patients in at-home settings. Roth was formally charged by the Attorney General’s office in July of 2016 with possession with intent to deliver schedule 2 narcotic Fentanyl, and six counts of identity theft, and three counts of larceny in a building. Roth’s criminal hearing is scheduled for November 27, 2017. Roth is no stranger to sanctions and investigations. In 2004 he was disciplined by the Michigan Department of Community Health and given a 6 month probation for violation of duty/negligence. The list of violations—including previous at-home abortions—stretches back to 1997, included failing to keep accurate charts on patients, not requiring blood work before procedures and issuing prescriptions without listing the rationale. In 2012 Roth was once again under scrutiny. He received another 6 month probation and ordered to pay a $15,000 fine for violating the state Public Health Code. In polls majorities of Americans consistently object to being forced to pay for abortions with their tax dollars. 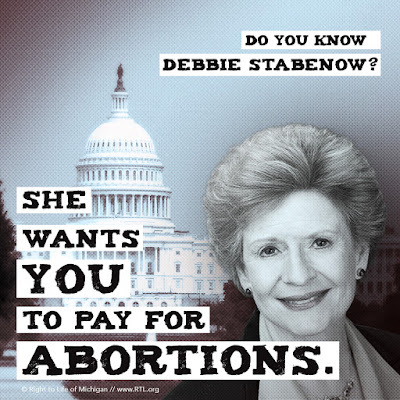 Besides many votes in favor of tax-funding of Planned Parenthood, the nation's number one abortion provider and promoter, Senator Debbie Stabenow has supported direct taxpayer funding of abortions for a long time. 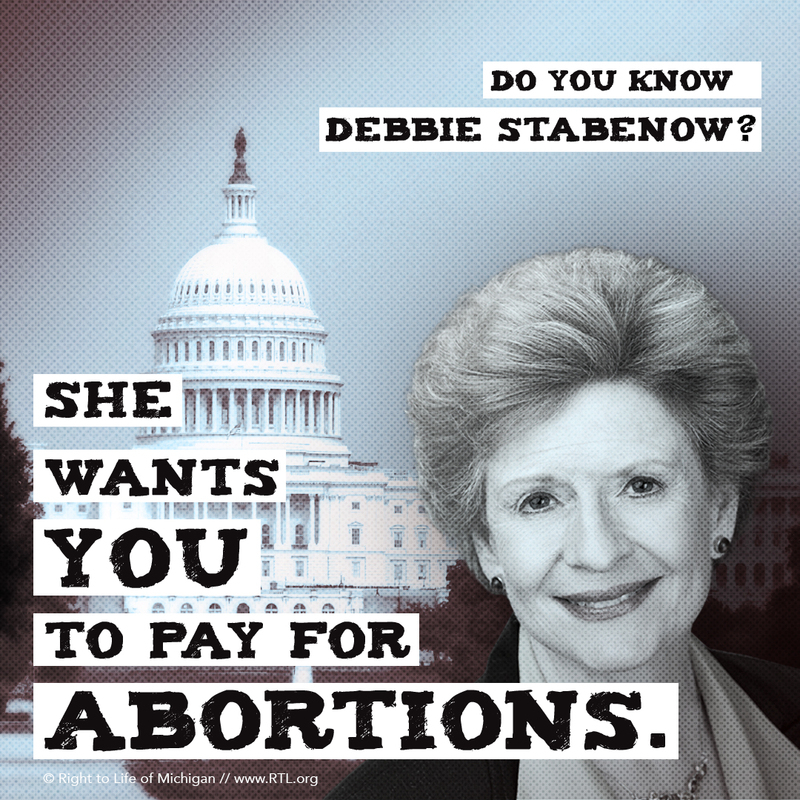 Debbie Stabenow voted as a member of the Michigan Legislature in 1987 to continue to force taxpayers to fund elective abortions through our state's Medicaid program. The ban on Medicaid abortions passed—over her objection—and was affirmed by 57 percent of Michigan voters in 1988. Abortions in Michigan dropped by 10,190 from 1988 to 1989. The Medicaid abortion ban in Michigan has saved many tens of thousands of lives since 1988, people who would not be alive today if Stabenow had succeeded. Federally the Hyde Amendment is an annual budget rider that prevents federal taxpayer dollars from paying for most abortions. It's been enacted every year since 1976. Senator Debbie Stabenow has often voted against including the amendment in various forms in numerous pieces of legislation. She voted against including it in Obamacare, forcing taxpayers to pay for elective abortions through health insurance plans in several states. She voted to directly fund abortions in our nation's capital, the District of Columbia, in 1998. She voted to let abortions be performed inside federal prisons in 1999. She voted to cover abortions for federal employees through their health insurance in 2000. She voted to let abortions be performed inside our nation's military hospitals several times, most recently in 2003. Have you ever noticed how simple the prolife message is? Unborn children are human beings, and killing innocent human beings is wrong. Have you ever noticed how convoluted arguments for abortion are? What do violinists and artificial wombs have to do with abortion? Vox recently published an article about the recent advances in creating an artificial womb. It isn’t used yet on humans, but new experiments are being done on lambs and seeing some success. The author, Harvard Professor I. Glenn Cohen, considers this scientific development and how it might effect arguments for abortion. He poses the question: “Could anti-abortion laws require pregnant women whose fetuses are not yet viable to transfer the fetus to a nurturing site outside the body, possibly by way of minimally invasive surgery?” Could artificial wombs end the justification for abortion? According to Cohen, there are three types of parents: gestational parents, legal parents, and genetic parents. He believes a woman can't be forced to be a gestational parent and has the right to stop gestating (carrying) the fetus to term. He also believes laws can’t force legal parenthood on a woman. Artificial wombs counter these two arguments, meaning women don't have to continue gestating children, and the children could be adopted. Abortion supporters shouldn't worry about artificial wombs, however, because Cohen invents a new right to an abortion: the right to not be a genetic parent. Apparently you have a right to not have people related to you. Who knew? This new right means artificial wombs and the current legal justification of abortion based on viability don't matter. How convenient, right? The author also brings up the old abortion argument of the violinist. This is a popular argument to support the legalization of abortion, despite being fatally flawed. If you don’t know, this violinist argument is a farfetched scenario where you must imagine waking up being attached to a bunch of machines against your will, and these machines are also attached to a world champion violinist, keeping him alive. Why would a sinister band of concert enthusiasts kidnap you to keep their favorite maestro playing? The purpose of the argument is to have you think about being in this situation yourself, if you would pull the plug. Pro-abortion people argue that this situation is just like pregnancy in that you are being forced to keep someone alive against your will. This analogy is irrelevant to reality for several important reasons, most of all that creating your own child through a voluntary act is not like a kidnapped violinist being hooked up to you. This argument creates another distraction—an interesting one at least—from what is really going on: children are being killed in the most brutal fashion. The supposed right to abortion does not spring out of autonomy, or liberty, or the nature of the child. Do abortion supporters honestly sit down and think up how to deal with the abortion issue first and then apply those principles? Every abortion supporter starts from the place that they don’t want a baby, or someone else shouldn't be burdened with a baby. Then they think up ways to justify the unjustifiable, the same way a child rationalizes stealing a cookie from the cookie jar. Abortion is about dead babies; the arguments are just window-dressing to make the horrendous palatable for our seemingly civilized times.